Profile Tycora Sandain was a dutiful cleric of Iomedae and a Chelish immigrant. She served in the Steel Falcons under Seriphos, and died in the ruins of Anen-Prezcha fighting a twisted version of the Storm King. Tycora was posthumously promoted to the rank of Sargent for her bravery in battle and devotion to the cause. Born to Chelish nobility and raised with the intentions of being given to the Hellknights as a means to curry favor, Tycora was whisked away from Cheliax by her father when the civil war broke out in 4710. Tycora's sister Lycara was unable to escape Cheliax, and when their mother discovered what their father had been planning, she turned him over to the Chelish inquisitors to be executed. With Tycora gone, Lycara was offered up to the Hellknights in her place. Tycora never knew the fate that befell her sister or father. Penniless and alone, the ship Tycora was smuggled away on arrived in the city of Almas just days after the Chelish fleet was demolished by the Knights of the Bleeding Rose in what is considered to be the start of the Civil War. She was taken in by the church of Iomedae and raised to become a servant of the Inheritor. Gifted and bright, Tycora was quick to learn the skills of priesthood. 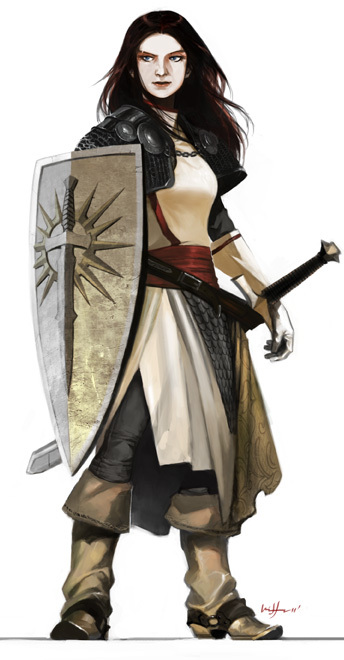 In honor of her father's actions, Iomedae saw fit to join the Eagle Knights after completing her training to become a cleric of the Inheritor. When Seriphos Kitojin rose to fame in the Eagle Knights, Tycora was assigned to serve under him by then Knight-Marshall Reinn. Faithfully serving her commander, Tycora would accompany Seriphos and his companions to the mountains of Anen-Prezcha at the behest of The Professor to search for the legendary Castle of the Storm King. During a battle with the fleshwarped Storm King himself, Tycora was slain defending her companions. When her remains were returned to Almas, she was given a hero's funeral and posthumously promoted to the rank of Sargent. Knight-Marshall Delecroix commissioned a memorial that was constructed in 4743 in the garden of the Church of Iomedae in Almas.